This collection of CIESM workshops on emerging issues by key experts in their field, was launched in 1997. More than forty volumes have already been published, presenting syntheses of the topics discussed. Details of their contents can be accessed by clicking on the meeting locations. You may access the table of contents and download the executive summary of each volume by clicking on the relevant city in the list below. 50 - Engaging marine scientists and fishers to share knowledge and perceptions - Early lessons. 49 - Searching for Bacterial Pathogens in the Digital Ocean. 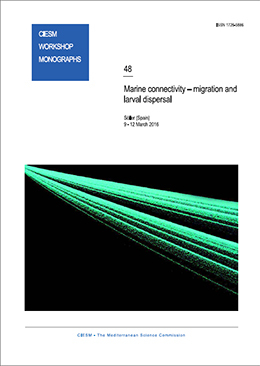 48 - Marine connectivity - migration and larval dispersal. 47 - Submarine Canyon Dynamics in the Mediterranean and Tributary Seas - An integrated geological, oceanographic and biological perspective. 46 - Marine litter in the Mediterranean and Black Seas. 45 - Marine extinctions – patterns and processes. 44 - Molecular adaptations of marine microbial life to extreme environments – Mediterranean opportunities. 43 - Designing Med-SHIP: a Program for repeated oceanographic surveys. 42 - Marine geo-hazards in the Mediterranean. 41 - Marine Peace Parks in the Mediterranean – a CIESM proposal. 40 - Phytoplankton responses to Mediterranean environmental changes. 39 - Climate forcing and its impacts on the Black Sea marine biota. 38 - Dynamics of Mediterranean deep waters. 37- Economic valuation of natural coastal and marine ecosystems. 36 - Impacts of acidification on biological, chemical and physical systems in the Mediterranean and Black Seas. 35 - Climate warming and related changes in Mediterranean marine biota. 34 - Towards an integrated system of Mediterranean marine observatories. 33 - The Messinian Salinity Crisis from mega-deposits to microbiology – a consensus report. 32 - Impact of mariculture on coastal ecosystems. 31- Marine sciences and public health - some major issues. 30 - Fluxes of small and medium-size Mediterranean rivers: impact on coastal areas. 29 - Fluid seepages / mud volcanism in the Mediterranean and adjacent domains. 28 - Production and fate of Dissolved Organic Matter in the Mediterranean Sea. 27 - Strategies for understanding mesoscale processes. 26 - Novel contaminants and pathogens in coastal waters. 25 - Investigating the roles of cetaceans in marine ecosystems. 24 - Human records of recent geological evolution in the Mediterranean Basin - historical and archaeological evidence. 23 - Mare Incognitum? Exploring Mediterranean deep-sea biology. 22 - Mediterranean biological time series. 21 - Ecology of marine viruses. 20 - Alien marine organisms introduced by ships in the Mediterranean and Black seas. 19 - Metal and radionuclides bioaccumulation in marine organisms. 18 - Erosion littorale en Méditerranée : dynamique, diagnostic et remèdes. 17 - Turbidite systems and deep-sea fans of the Mediterranean and the Black seas. 16 - Tracking long-term hydrological change in the Mediterranean Sea. 15 - Mediterranean Mussel Watch. Designing a regional program for detecting radionuclides and trace-contaminants. 14 - Gelatinous zooplankton outbreaks: theory and practice. 13 - African continental margins of the Mediterranean Sea. 12 - Fishing down the Mediterreanean food webs? 11 - Investigating marine microbial loops : new tools and perspectives. 10 - The Eastern Mediterranean climatic transient : its origin, evolution and impact on the ecosystem. 9 - Role of sea surface microlayer processes in the biogeochemistry of the Mediterranean Sea. 8 - Scientific design and monitoring of Mediterranean marine protected areas. 7 - Precautionary approach to local fisheries in the Mediterranean Sea. 6 - Mediterranean Scientific Drilling prospectives. Granada, June 1999, 192 p.
5 - Gaps in Mediterranean Fishery Science. Dubrovnik, June 1998, 39 p.
3 - Ocean-atmosphere processes and biogeochemistry of the Mediterranean. 2 - Current issues on marine microbiology. Siena, August 1997, 36 p.
Nicosia, May 1997, 70 p.